It's a shame to see a gardenia with yellow leaves. In addition to the beauty and smell of its flowers, its shiny, dark green leaves are a major selling point. Such yellowing could also be warning you of poor plant health. Before learning the possible causes of (and solutions to) this discoloration, let’s find out exactly what a gardenia is and what growing conditions it prefers. Gardenias are broadleaf evergreen shrubs. They can be grown outdoors year-round in USDA planting zones 8 to 11. Further north, they are often grown in containers for use in patio landscaping during the summertime and then brought indoors as houseplants to protect them from winter’s cold. Mature size for a gardenia can be as much as 8 feet tall and 5 to 6 feet wide. Sufficient nutrients from compost, etc. Failure to satisfy one or more of these growing needs can be the cause of yellow leaves. While you never want to see yellow leaves on your gardenias, it is important to realize that their presence does not always indicate a problem. Come spring, it's normal to see some yellow leaves. This is simply part of the process of older foliage dying off to make way for new leaves. During other seasons, it's not normal for gardenias to have a lot of yellow leaves. Complicating the issue is the fact that you cannot automatically attribute the yellowing to just one cause. Instead, you must work your way through a checklist of possible causes to find the answer. For any individual gardenia plagued with yellow leaves, you must eliminate all of the possible causes that don't fit until you arrive at the one that does. Check for signs of disease (such as the mold left by fungi) and insect infestations first so that you can rule them out (or treat them immediately if they are present). Once you've ruled out diseases and insects, explore the possibility that your gardenia suffers from chlorosis. It can be satisfying to attach a name to a condition, but saying that a plant with yellow leaves has chlorosis really only just begins to tell the story. On a technical level, it means that the affected plant is not getting enough chlorophyll and is, therefore, suffering from a nutrient deficiency. But, on a practical level, this still does not identify the cause. There can be more than one reason for such a deficiency. Moreover, there are different kinds of chlorosis (each indicative of a different nutrient deficiency). Send a soil sample into your local county extension and have them test it for deficiencies. The extension may recommend a solution for you, as well, when they deliver the results of the test. But don't assume you can simply fertilize to solve the problem. The issue may be that, although the required nutrients are present in the soil, the gardenia is unable to access them. This is why it's important to know what kind of soil pH your plant needs. In the case of acid-loving plants such as gardenias, if they are growing in a soil that's too alkaline, the nutrients they need (even if present in the soil) will be unavailable to them. To reduce soil pH and make it more acidic, you can use a fertilizer containing sulfur, for example. The problem of nutrient unavailability can also occur if the plant in question has suffered root damage, which can happen if your gardenia roots are sitting in water. Roots need to breathe, and drowning them in water cuts off their air supply, resulting in damage. 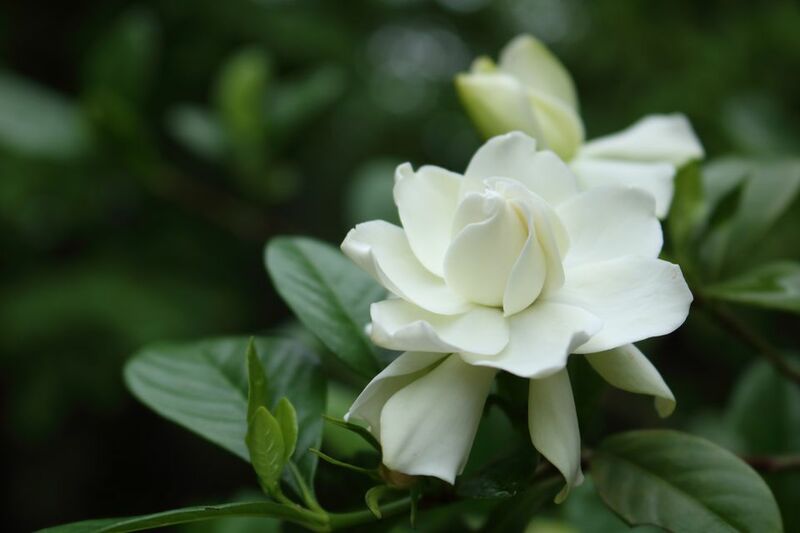 Thus the need to pay attention to two of the other growing needs for gardenias: a soil with good drainage and adequate (but not excessive) moisture. These conditions are closely related since a soil with poor drainage is likely to be too wet even if you are not guilty of over-watering. If root damage has occurred, it may be too late to fix the problem (and would be a lot of work): Replace the gardenia. Just don’t make the same mistake again, whether it was over-watering on your part or simply poor drainage. Your goal in watering is to keep the soil evenly moist (right through the root zone); it should not be soggy. To prevent drainage problems, work a lot of organic matter into the soil. If you have ruled out incorrect soil pH, poor drainage, and over-watering as possible causes for yellow leaves on your gardenia, then consider yourself lucky. The fourth growing need, sufficient nutrients, is met easily enough if such nutrition has been lacking. Simply fertilize. Start with a balanced fertilizer unless you know for sure which nutrient is lacking, in which case you can become more targeted and apply a fertilizer high in the missing nutrient (being careful to follow application instructions closely). When Can I Cut Back the Browning Leaves of My Flowering Bulbs?